http://en.wikipedia.org/wiki/Pixel to see the Wikipedia page on pixels. Is there a minimum number of pixels I can buy? The minimum number of pixels you can have is a 10 pixel by 10 pixel box. Is there a maximum number of pixels? There is no maximum number of pixels you can buy, but all purchases must be in multiples of 10 x 10. Do pixels have to be in multiples of 100? Pixels must be purchased in multiples of 100 pixel boxes. What do I get for £10? 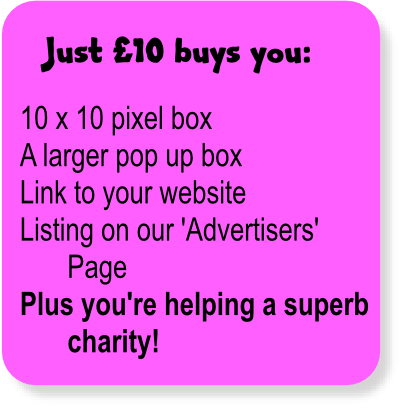 In exchange for your £10 we give you a 10 x 10 pixel box, a roll over image of 150 pixels wide x 180 pixels high (or 3.96cm wide x 4.76cm high) and a link to your chosen website for 2 years. Can I put whatever I like on my pixel box? All images must comply with our terms and conditions and follow our decency policy, but essentially you can pick whatever you want for your pixel box. What colours can I use in my pixel box? You can chose whatever colours you like. Anyone can purchase a box. All donations go to Sue Ryder St Johns, so if you are an individual and would like to get involved then if you like you can opt not to include a hyperlink or rollover image. Can anyone buy a box? Anyone can buy a box as long as they comply with our terms and conditions especially in areas such as decency. What size does my logo need to be? Your rollover logo or image must fit into a 150 pixel wide x 180 pixel high box (or 3.96cm wide x 4.76cm high). What format does my logo need to be? We can accept PNG, GIF, TIFF and JPEG/JPG images. If you do not have a professional design software package already, free ones can be found on the internet or, alternatively, you can use the standard Microsoft Paint programme that is available on most standard PCs. Can you design my box for me? Unfortunately we cannot design your box for you. We do have standard templates available if you would like to chose one of those (please let us know if you would like a copy) or you can enlist the help of a graphic designer. Do I need to send you a logo? If you would like your pixel box to have a rollover image (an image which pops up when a viewer rolls their cursor over your pixel box) then we need your logo image. You can chose not to include a rollover image if you wish. Do I need to send you a URL? Your URL or domain name is used so that when a viewer clicks on your pixel box your website will open. Will I be able to see a proof? As you are designing the images yourself we do not provide proofs before posting them to the website. How much does each box cost? Each 10 pixel by 10 pixel box costs £10. How much does each pixel cost? The price for each pixel is 10p. However, please note that all pixels must be bought in multiples of 10 pixel by 10 pixel boxes. How much of my £10 goes to Sue Ryder? Every penny of your £10 is donated to Sue Ryder. The website is managed and donated to Sue Ryder for free by Truesilver Coaching & Marketing and all payments are handled by the Sue Ryder Charity. Truesilver do not receive payment or commission for your purchase. Can I remove my images from the site once they have gone live? help@100kchallenge.co.uk. We regret that should you remove the images after they have ‘gone live’ Sue Ryder cannot refund your donation. Can I make changes to my box once it’s been posted? The £100,000 Challenge is managed and maintained for free by Truesilver Coaching & Marketing. Who are Sue Ryder St Johns? How do Truesilver get paid? Truesilver do not receive payment for any of the website management or marketing services that we are providing to Sue Ryder. 100% of all donations go to the charity. Why have Truesilver donated their time and resources to charity? We believe that helping charities and ‘giving a little back’ is important even for small businesses. We have donated this website, the hosting and all marketing services as part of our yearly charitable donations. What if do I do if I have a complaint about a company, link or image featured on your site? help@100kchallenge.co.uk. A serious complaint might involve copyright infringement, indecent images or other legal issues. Link An abbreviation of hyperlink. Hyperlink Your website domain name which will open up in a separate page when a viewer clicks on your pixel box. URL URL is the full domain address needed to set up your hyperlink. Please support our bid to raise £100,000 for Sue Ryder.